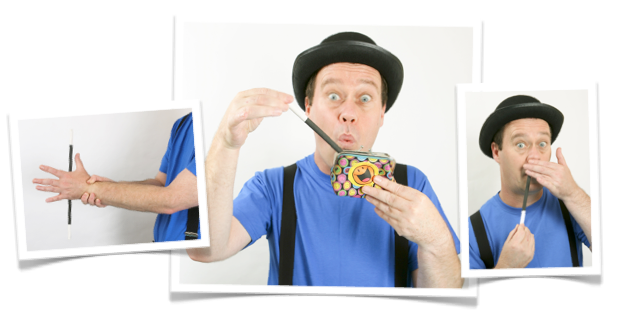 Learning easy magic tricks with wands is something every magician loves to do. We are going to show you how to make your own magic wand and then how to do real magic with it! To make the magic wand, you will need to cut the thicker dowel stick to a length of about 35 – 40 cm and the thin dowel rod to about 7 to 10 cm using a hacksaw. Ask a grownup to help if you find it a bit tricky. Remember to cover your work area with old newspaper and wear old clothes when you do painting. Cut the thicker dowel stick to about 35 – 40 cm. Wrap a piece of masking tape about 4 – 5 cm from the ends around the dowel rod – these will be the white tips if your wand. TIP: remember to cover your work area and clothes. 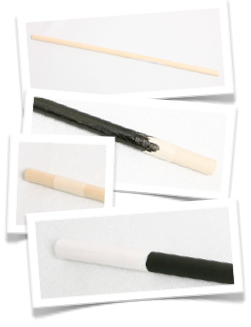 Paint the piece of the dowel rod in between the masking tape black with your poster paint. Leave to dry. Paint another coat if you need to. Once the black paint is dry, remove the masking tape and paint the tips with the white poster paint. Leave to dry. Paint another coat if you need to. Repeat steps a – d with the thin dowel stick and you have a mini magic wand. Ta-da! Now you have magic wands! Then produce a full size magic wand out of the same purse right in front of their eyes! To make the wand appear, you need to cut a small hole in the bottom corner of the purse. The full size wand needs to comfortably fit through the hole. Place the tip of the wand through the hole and hide the rest of the wand with your arm. It is important to watch your ‘angles’ when you do this so that your audience doesn’t see the wand behind your arm. To ‘produce’ the wand out of the purse, you simply pull the wand through the hole, all the time making sure your audience doesn’t see the wand. If they do see it, it is called ‘flashing’ and they can see how the magic is done. 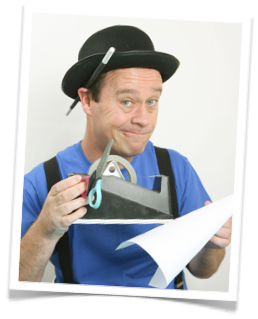 ‘Angles’ in magic, refers to the angle or direction from where your audience is looking at your performance. Some tricks like this one, needs special attention to the direction from where your audience is watching the trick, to make sure the secret stays hidden. To ‘produce’ or to do a ‘production’, is to make something appear as if by magic. When we talk about ‘flashing’ it is when a magician shows something that is secretly hidden by accident, like in this case, the wand that hidden behind your arm. The magic wand magically ‘sticks’ to your opened hand… and then drops on your command! When it comes to easy magic tricks with wands, this one is probably the easiest. 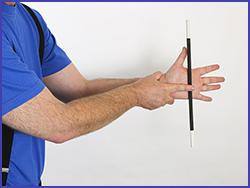 To create the illusion of the wand ‘sticking’ to your hand, you keep it in place with your index (your pointing) finger that is hidden by your other hand. Look at the picture to the left. To drop it, you simply lift your finger! Remember to watch your ‘angles’. 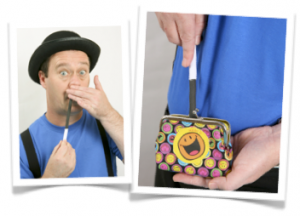 Make your wand disappear and reappear from a ‘black hole’ in the purse or even up your nose! Using your wand to measure, cut a piece of white paper the same height as the white tip of your magic wand. It needs to be able to wrap around the tip of your wand. Stick the piece of white paper with a piece of see-through sticky tape so that you have a little tube. 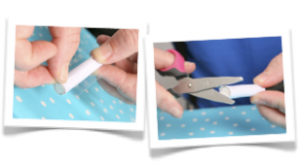 Make sure that you don’t stick it onto the wand as the paper tube needs to be able to slide up and down the wand. 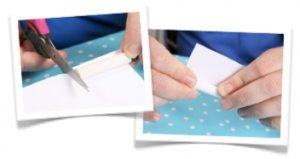 Trim any excess sticky tape and paper off with a pair of scissors to give you a neat edge. Now you have your ‘gimmick’ for the black hole magic wand trick. 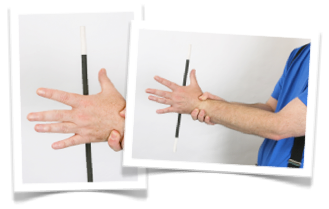 Have fun amazing everyone with this easy magic trick with wands! 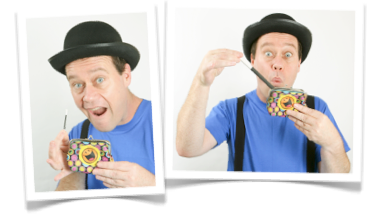 I have enjoyed Julians Magic School for a couple years but lately Julian has tailed off on his tricks and then I came across your website and found it most entertaing especially the interaction between you and your daughter (I think). Also although I have only seen a half dozen tricks, a couple of them I had never seen before. Keep up the good work. Hi Bill, so glad to hear you are immersing yourself in magic. I can relate to that, I eat, sleep and breath the stuff. Thanks for your comment and I do hope you feel at home here. 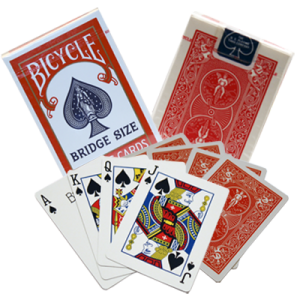 This is an awesome site and will be using it to teach my Magic Tricks and Puzzles summer school class. The tricks that I have viewed so far will be easy for my young students to do. Plus most things are done with items around the house! This trick is so much fun, I will have to use it in my shows. I am a children, family, AND adult entertainer, and I can think of ways to entertain all three groups with this one. This was time well used, thanks for the tip! This is going in one of the next shows I do.